Sometimes you have to take a step back to see things clearly. This quote is important for day 13. As the team is getting away from the studio, the project and our routine. We walked through nature and allowed the fresh air to clear our minds. The silhouette of Berlin city stood in stark contrast with the horizon, peaking through the fresh spring air. There is a certain magical element to be at the brink of spring, plants are starting to bloom and everything is starting afresh. This clean freshness is the key inspiration for today. Day 13's blouse is made to look fresh and clean. 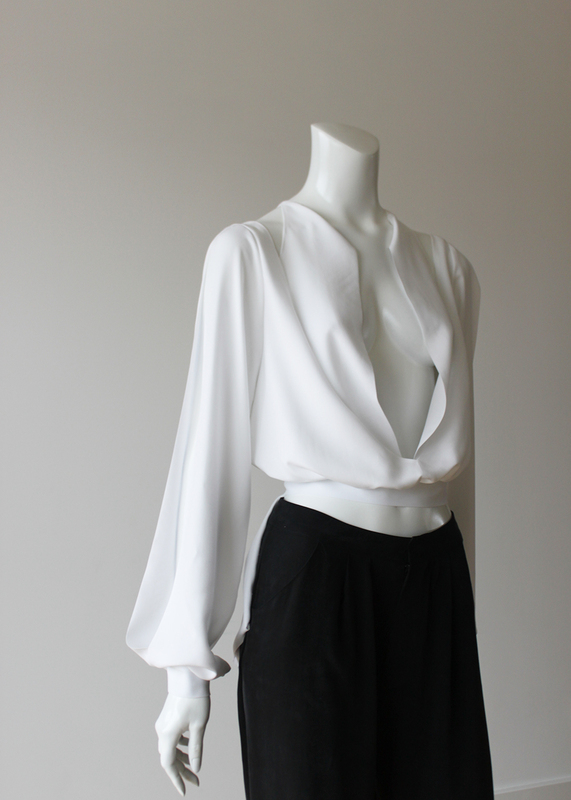 The blouse is voluminous; however, it cinches at the waist, thus creating a contemporary feminine silhouette. The sleeves are open at the shoulders and play with volume, this mirrors the waist shape by cinching at the wrists to create balance. Today's design is feminine and flirty with a low neckline. It is about the feeling of spring and the changes of season creating changes in silhouettes, heavy winter wear to light spring designs. We are nearly half way through our 30days / 30designs womenswear project and getting away from Berlin and getting a new perspective was vital at this time in the project.